Stash Building Basics - Solids are a MUST! This is a joint post by me, Becky, and Rachael—she took all the pictures! One of the things we’re doing is trying to make some more order in my sis’s chop shop, which is her cutting area. She got her husband to put together a really long table area - one long enough to unroll a 6 yard length of fabric. We were perusing what we have to sell and what isn’t yet on the site - and she mentioned that she didn’t yet have a solids pack - has never made one, in fact. That surprised me, in fact, as I had made a rail fence quilt using black and solids - the rail fence block was not just a regular block - it has a bigger center than the top and bottom rails as shown to the side. Anyway, I used solids and it was very successful. People liked them and they were a hit with the younger set - teens and 20 somethings. We are considering making a kit from them if that is something people are interested in. Let us know what you think in the comments about that if you have an opinion! But anyway, thankfully, the “modern quilt movement” brought solids back to popularity - of course the irony that the Amish use them and have used them and used to use them isn’t lost on me. I appreciate modern quilters telling the traditionalists that solids are fine to use in quilts! I appreciate that especially since I normally live in Poland and often that is what we have - solids. We don’t have the fancy blenders and tone on tone prints very often. More often than not, it’s solids that we use as our sashings and blenders and thing that ties the blocks all together. Ken, Rachael’s husband, willingly held up the fabric so we could see it better! Here are a few close ups of the process of cutting these into packs. First, she puts them on top of each other on this long table, then cuts them, folds them and places them in bags. So…Rachael decided that we needed to make a cool colors pack and a warm colors pack. 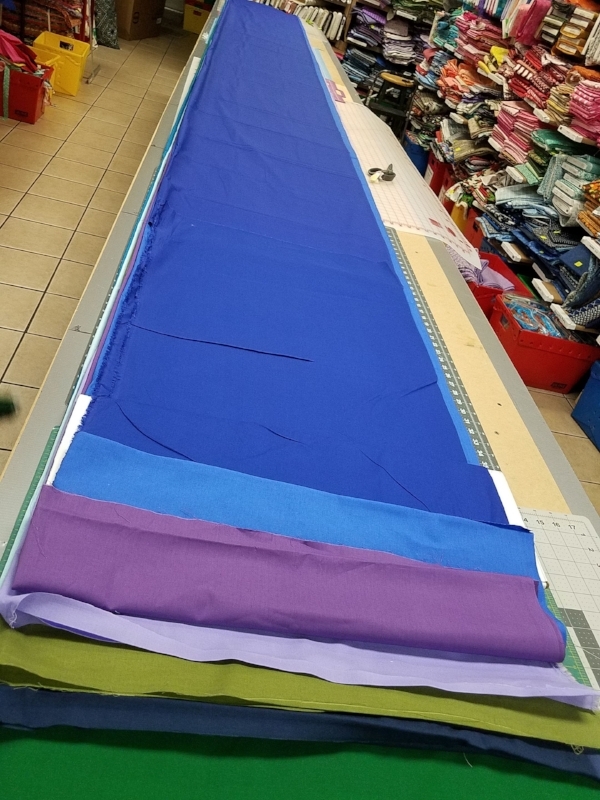 This is what we came up with - a half yard piece in 10 different colors - just for whatever it is you need! This is how my sis folds them before putting them into a plastic bag for shipping. The warm colors pack - these are just very rich colors - nicely saturated colors! Now wouldn’t these cheer you up on a blustery day? Be sure to get your pack - by clicking on the links below! Here’s the link to the warm pack - reds, oranges, yellows! Each pack is only $20 and your solids are 100% cotton. So, what did I (Becky) do with regards to this pack? Well, I helped choose the colors. Rachael has a bunch of different solids and we were looking through them and trying to decide what we have enough of to make into packs - as my sis likes to make at least 20 or so packs of the same kind. That’s not much, is it? I guess I didn’t do that much with these! (I did create that block shown above in EQ on her computer. Does that count?). I’m getting kind of homesick for my sewing machine, BTW. The break has been good - and while I have a set up at my mom’s - it’s just not the same as one’s own place. Don’t forget to comment if a kit with 7 different solids and enough black to make a 60”x80” (approximately) quilt would be something you would be interested in.